Boston Gnome Summit 2007... Taiwan? This weekend is Thanksgiving, Columbus Day in the States. That means I would normally be attending the Boston Gnome Summit. This year, my travel schedule has been plentiful enough that I decided to spend Thanksgiving with the family. Of course, as soon as that was firmly decided, work decided to send me to Taiwan. Ha! I leave tomorrow. This afternoon I came across an Ontario Provincial Police car like no other I had seen before. Apparently, the police force is using at least one Honda Civic SI, with the new paint scheme. Nice cruiser! There were a few things that struck me as interesting. First, the car is not an American brand. Unusual. Second, a quick peek in the window indicated that it has a stick shift. Very unusual. In fact, I never thought I would see the day when a public service vehicle in North America would not be an automatic. 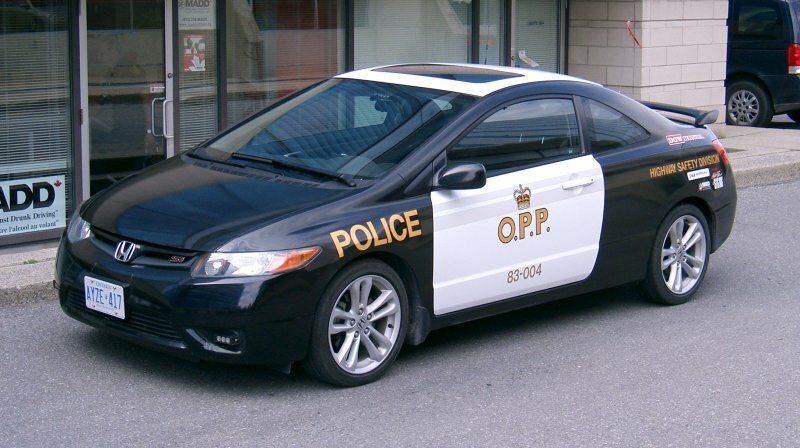 In the past, the OPP has had a donated Mercedes, a Ford Focus, and a Dodge Caliber. But those were single cars. Maybe this Honda is a sign of more to come?